The past few weeks have let me realize that my parents are not getting any younger. I need to make sure that certain allowances and care are given to them especially since I am the eldest girl. They are still sharp and ambulatory, fortunately, so they can still be left at home by themselves. However, I need to make sure that features at home are not accident prone. There are elderly people who would need assistance with walking. This is why walkers and rollators with seats are one of the most sold out medical equipment when it comes to geriatric care. 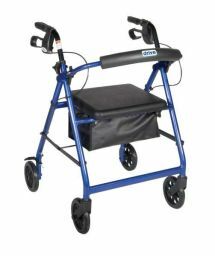 Medical walkers are ambulatory aids that were designed to help seniors become independent despite those conditions that make them have difficulties in staying balanced while walking or standing up. There are roughly two types of walkers, those with wheels and those without wheels. There are also walkers with seats and those without. One needs to choose the best medical walkers that fit the one that is using it. 1.Â When it comes to the handles, choosing the right grip is a must to ensure that your hands and the bones in them don’t get deformed. 2. Be sure that the handles are of the appropriate height as you hold on to them. This will prevent undue stress and pressure on your arms, shoulders, and the back. See to it that your elbows bend at a comfortable angle and that when you place your hands at your sides, the handle reaches the crease lines of your wrists. 3. Test the product first. To test your walker, put your weight against it while keeping your back straight then take a step into the device, be sure that the walker doesn’t move as you take a step. This entry was posted in Home Remedies, Home Talk by admin. Bookmark the permalink.